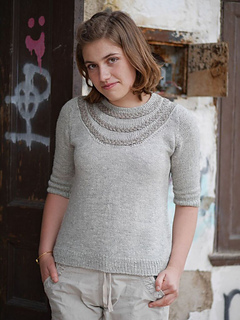 This versatile pullover in eight sizes (XS/S/M/L and 1X through 4X) is a great multi-seasonal addition to any wardrobe when knit in a plant-based yarn blend. Worn alone or layered under a jacket it will tie together a skirt or trouser outfit for work, but also plays well with shorts and jeans for weekend fun. The design features a two-tone yoke created by by short rows with cabled insets and body shaping through the torso; elbow length sleeves add just the right amount of coverage for a neat, modern look. Substituting yarn and/or needles may result in an overall variation in size and drape.